When we hear about a road trip in Mexico, we can only be sure that it will be a journey full of adventurous moments, some of them sweet, some others might be sour, but for sure all of them memorable. What we had on our minds when thinking about Mexico before we get to visit it, was, indeed, confirmed by the unparalleled beauty of the landscape and the contrasts of it that composed a beautiful novel of memories that will definitely stay engraved in us. 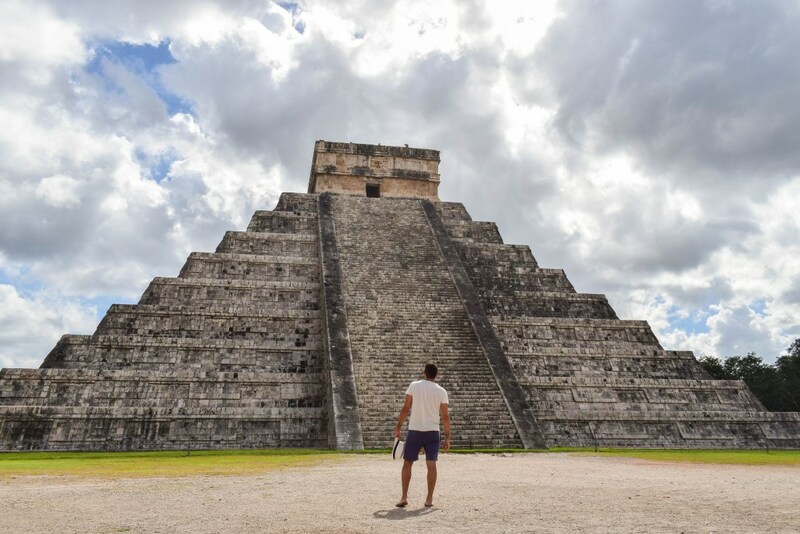 Since a road trip in Mexico could never be enough to get to explore this country (especially when it was only for 12 days), we thought it might be wiser to spend it exploring the Yucatan Peninsula. In this very particular part where the three countries are united (Mexico, Guatemala, and Belize) is exactly where the civilization of the Mayas was first created! So let’s wander together in the places where we visited and share information and our experiences from this travelogue of ours. Vamos Mexico! After spending 17 hours in the plane and having 4 hours delay in the snowy Paris, we finally landed in Cancun, where was the beginning of our road trip in Mexico. Cancun is a quite famous tourist wise city, especially for the Americans that visit it, basically to enjoy the Caribbean seaside and the luxury that the numerous all-inclusive hotels have to offer. Cancun is a tourist resort so, you cannot really sense in its splendor the distinctively true vibe of this country. You can always enjoy the beautiful beaches – oh that Playa Delfines stole our heart- as well as the luxurious services offered and start your journey really revived. Right across Cancun, you can visit La Isla Mujeres, which is perfect for one-day trips. It is a small island where you can easily use a golf cart to explore it, which is actually something is usually done there so it won’t be difficult to find one. One of the places we loved the most during our road trip in Mexico was Tulum. Amazing beaches with pure white sand, Tulum was really quiet compared to the rest of the Mayan Riviera and is highly recommended for those who are seeking to avoid crowded places but also want to have fun. In the small town of Tulum, you will find really cheap places to stay and cozy restaurants to eat at, as well as places to have fun and see how the locals spend their day as they have a very calm lifestyle. If you decide to stay in any of the resorts by the seaside you might need to pay something extra. We decided to stay in the city center which was a bit further from the beach, but if you have a car, it only takes 7 minutes to get there. The highlight of our stay in Tulum was our visit in the archaeological site of the Mayas, the delicious tacos and the cenotes (underwater rivers that appear on the surface like water tanks in a cave)! The lagoon that has all the 7 shades of blue! That’s how they call Bacalar Lagoon and it’s not an exaggeration. Located close to the borders of Mexico and Belize, it is the small city of Bacalar. It really worth paying a visit there just to see this amazing lagoon- you can always rent a small excursion boat- and of course try the delicious food (and its great location) of «La Playita». One more archaeological site of the Mayan culture that is very interesting to visit and enjoy an excursion! In this ancient city, you will find the only Mayan pyramid (42 meters high) that is still allowed to climb (surprisingly though!). What would seem ideal is renting a bicycle, like we did, since this site is quite big! What could be better than enjoying a bicycle ride in the jungle, where we could see every here and there remains of the mysterious civilization of the Mayas. Our most favorite city during our road trip in Mexico! We said goodbye to the Mayan Riviera and drove with direction to the heartland where we finally arrived at this colorful town! This city is literally colorful, picturesque and at this place, you really feel what Mexico is all about. With a population no more than 300.000 you will be able to enjoy the peaceful lifestyle of the locals, Yucatan’s tasty cuisine, the cenotes and the colonial architecture. Even though we got robbed, it was without any doubt our favorite city! Additionally, it is located in a quite strategic point as it is in a very close distance with many sites like Chichen Itza. It is without any doubt the most famous archaeological site of the Yucatan Peninsula. We are talking about the city of Mayas, known as Chichen Itza. In fact, it is included in the list of the contemporary world’s 7 miracles (led by the New7Wonders Foundation). So, as you understand it was impossible for us not to visit it! And it was indeed, more than stunning. You might consider visiting this city a bit early in order to avoid the crowd. It is a fishing village that is well known for its national park (biosphere), the flamingos and the pink salt marshes! Even though there is not something really special about this village, it is worth taking a short excursion there just to see these flamingos. You just rent a boat from the pier, that takes you to the park, where you can enjoy every possible bird species. Anyways, we didn’t, actually, take this excursion since we wouldn’t have the chance to see the flamingos as it wasn’t the right time of the year to see that. We managed though, to visit the fishing village and the pink salt marshes! It is a perfect scenery to capture, other than that, there is nothing really distinctive about them. The biggest city of Yucatan’s Peninsula (it also has an airport!) as well as part of our road trip in Mexico. We only had the chance to spend a night there but we had enough time to experience many contrasts since this city is a mixture of modern and traditional colonial style. So if you are planning to visit it, try to stay near the historical center, which is actually the prettiest part. What we call Love At First Sight! The small yellow town is worth paying a visit, or at least a quick passing by. I can’t forget how thrilled we were when entering this peaceful city at noon, where everything was absolutely yellow. Absolutely surreal and pretty at the same time. And that’s how after 516545ish..kilometers driving, we returned to Cancun and headed back!